Souped-up Ford F-150s drifted, spun out, jumped and revved to the delight of the crowd at the 2018 SEMA auto accessories and gear show in Las Vegas. The massive convention isn’t strictly a truck event, but this year dozens of modified trucks stuffed the show floor, each touting its own reason for its modifications. While some were straightforward, others teetered on outrageous. 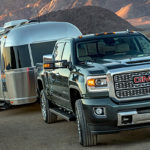 There were comically raised Ram 1500s, apocalypse-ready Ford Rangers and Ford F-150s more powerful than some of the muscle cars on display, more evidence that modifying Ford’s top-selling truck isn’t just a side project, it’s also a persistent and rapidly growing trend. This thirst for modification in pickups also can be seen at the factory level. Automakers have responded to consumer interest in customization by designing more limited and special edition trims that offer enhanced capability, along with body kits that give a more “aftermarket” appeal. Ford’s Raptor iteration is based on the same idea. Featuring a wider body, performance bumpers, a vented hood, running boards and a bolder grille, the Raptor is an aftermarket-style truck wholly manufactured by Ford. Busch’s F-150 – dubbed Frightening – was just one of many power-heavy F-150s. It was quite astonishing to watch Kurt Busch – a Nascar driver – spin out the tires on his modified F-150 and drive it in circles until the brakes caught fire. For a career race car driver like Busch, the thrill of modifying an F-150, even for daily driving, isn’t lost. Having the opportunity to build one and show it off at SEMA made it that much more rewarding. Busch told Trucks.com that customizing an F-150 has always been a dream for him, but, he added, there’s pressure to deliver something that everyone will like. This year, Ford sold nearly 750,000 of its F-Series pickups through October, a 2 percent increase compared with the same period in 2017. It’s also the top-selling vehicle in the U.S.
Aside from Busch’s Frightening, two other standout modified F-150s were at the SEMA show: Roush’s 2018 F-150 Nitemare and the Hennessey V8 Velociraptor. While Hennessey wasn’t shilling out rides in its Velociraptor, Trucks.com climbed in the passenger seats of two of the three powerful F-150s for a glimpse of each builder’s preference. It’s one thing to read “650 horsepower” on a spec sheet, but to feel it is something else. On paper, the 2018 Roush F-150 Nitemare is stacked. Aside from its horsepower, it also boasts 610 pound-feet of torque, a 5.0-liter V8 engine with Phase 1 Supercharger kit, Roush/Fox performance suspension and a Roush performance exhaust system. According to Jack Roush Jr., these modifications improve the performance of the F-150 without compromise. The same mileage backed by Ford’s factory warranty is covered by Roush, and the towing and payload capacity remain the same. From the roar of its exhaust system to the screech of its BF Goodrich KM3 tires, the Nitemare was a rush. A few drifting laps around the outdoor track and several airborne jumps demonstrated the impressive power behind the vehicle. Although comfort paled in importance to sheer power on the track, the truck’s custom Katzkin leather and suede seats were a nice touch – albeit one that was noticed after the ride. Next up was Busch’s Ford F-150 Frightening, a truck that lives up to its name. It has twin turbos capable of delivering 1,000 horsepower, along with 750 horsepower at the rear tires. The over-the-top power output makes it evident the truck was born from the mind of a racecar driver. Busch demonstrated this as he tore out of the staging area onto the track, showing off the Frightening’s acceleration. Then he whipped a series of donuts, causing smoke to billow from the tires. He then tore across the track, whipping from one corner to the other. That “snap back” feeling he described was real – the velocity pinned us to our seats, preventing any forward motion. Those 1,000 horses were as powerful on the track as they were on the spec sheet. Unlike Roush’s Nitemare, which featured a custom Hukil paint job, Busch’s Frightening is finished in a simple blue. 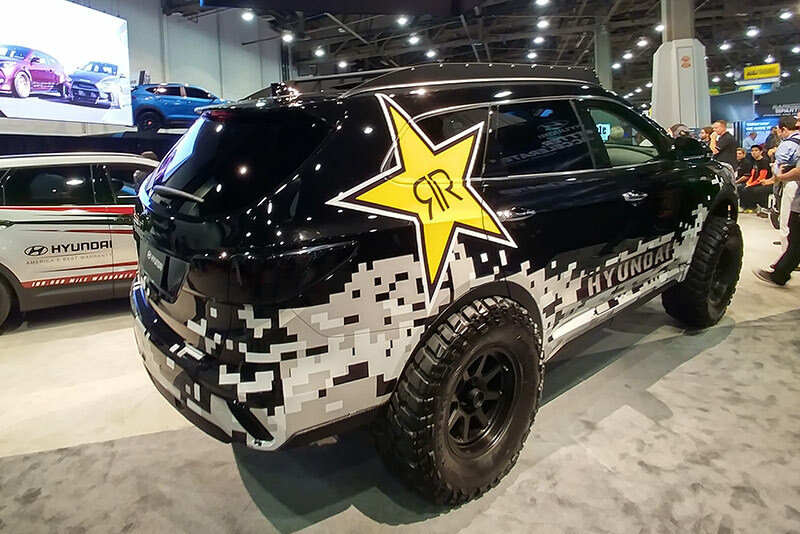 Perhaps to Busch, a truck doesn’t need flashy racing stripes or bright colors to appeal to the crowd – he’ll let its performance take care of that. One way to judge public reception of a trend is to let the public inform it directly. This is the route that John Hennessey, founder of Hennessey Performance Engineering, took when developing the F-150 V8 Velociraptor, a spin on Ford’s high-performance, off-road Raptor pickup. Hennessey, whose company created the Venom GT and Venom F5 supercars, built his take on the Raptor after his customers repeatedly asked for it. The finished product is on the 2017-19 Raptor body and features a 5.0-liter V8 engine, 2.9-liter supercharger system, an air-to-water intercooler, and an upgraded fuel injector and fuel system. With a 10-speed automatic transmission, the Velociraptor kicks out 750 horsepower (370 horsepower in the rear wheels) along with 675 pound-feet of torque. The modified truck embodied the idea that truck owners, just like performance drivers, crave power.